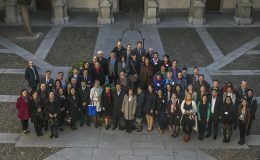 The 2nd workshop within the 1st working year of the Erasmus+ Project on “Promoting internationalization of research through establishment and operationalization of Cycle 3 Quality Assurance System in line with the European Integration (C3QA)” took place between November 16th – 17th, 2017 in Alcala de Henares, Spain hosted by the project partner University of Alcala (UAH). 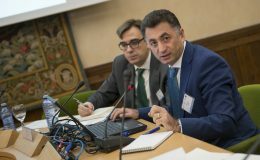 The workshop was aimed at developing the Regulatory Frameworks for EQA Cycle 3 Programs based on the fact-finding results identified by the Armenian, Mongolian, Ukrainian, and Kazakh representatives. The workshop was launched by the opening speeches of UAH Rector Prof. Fernando Galván and UFAR Rector Prof. Jean Marc Lavest. In order to establish new directions of cooperation the partners from UFAR, KAZGUU, UAH and KNUTE Universities signed bilateral partnership agreements between the universities. Afterwards, the state of affairs regarding the C3QA Project’s achieved outcomes and activities foreseen for the end of 2017 and the whole 2018 were presented by Mr. Arayik Navoyan, Coordinator of the C3QA project, Vice-rector of UFAR. 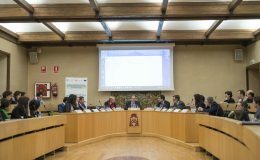 The workshop was then followed by 2-day lectures on Cycle 3 Programs presented by the speakers from the University of Alcala, AQU Catalonia, and University of Cantabria. It involved lectures by the Spanish EHEA, ENQA, and ANECA representatives who shared the Spanish experience on the Standards Fulfilment for the Accreditation of Cycle 3 Programmes. The main discussion topics that were addressed during the workshop touched upon the Salzburg Principles (from 2005 to 2017): EUA Council for Doctoral Education reports (Doctoral Education – Taking Salzburg Forward: Implementation and new challenges (2016)), Standards and guidelines for quality assurance in the European Higher Education Area, Ex-ante accreditation (if required by national regulations), Monitoring (if required by national regulations) and Accreditation. The culmination of the workshop was the Coordination meeting organized by the project’s EMT and resented by Mr. Arayik Navoyan addressed major issues on the project’s next activities foreseen in the end of 2017, timeline of activities foreseen in 2018, project financial situation and project communication. The Project’s Coordination meeting was summed up by approving the timeline of activities and setting the deadlines in terms of the upcoming meetings in Lyon, France and Astana, Kazakhstan in 2018. At the closing of the Coordination meeting Mr. Arayik Navoyan thanked all the participants for their presence and active contribution, as well as thanked UAH Team for the successful organization of the Alcala Workshop.